We all know how difficult it is for babiesto force to crawl out of a comfortable warm crib in the morning and gather in a kindergarten or school, especially if it's overcast, damp and cold outside. 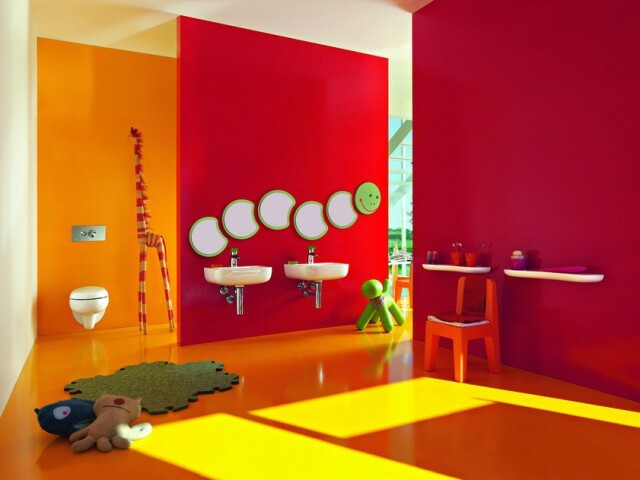 Designers of the company Laufen tried their best, creating sunny and playful interiors for children's bathrooms. 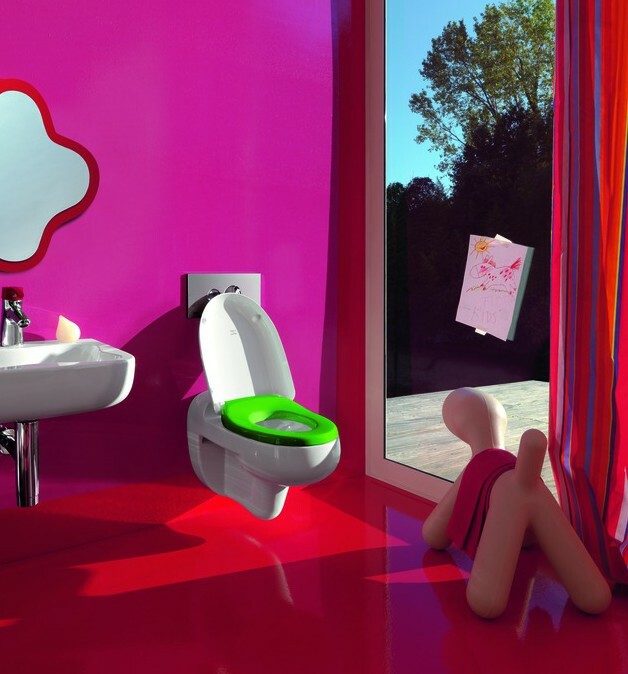 A series of colorful plumbing for children's bathroomsrooms was called Florakids - for children, flowers. The designers of Laufen emphasized the bright, juicy shades of the interior as a whole, decorating the interior with original decor elements that will raise the mood in the morning. 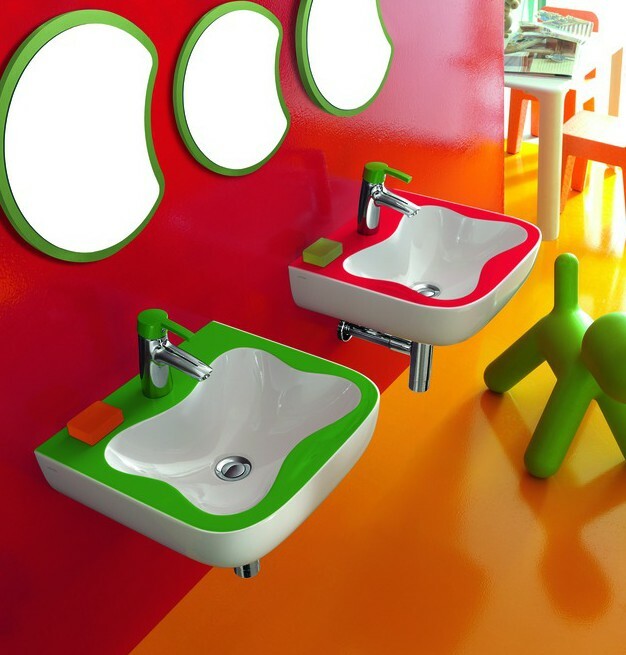 Pink, red and orange walls, plumbing in color, non-standard washbasins in the form of flowers - all this will cause the kid to smile and ask a positive carefree mood for the whole day! Mirrors on the walls in the form of flowers or caterpillars,decorative soft floor mats, stools and highchairs in the form of fairy-tale creatures and animals will transform the bathroom not just into the room where you need to wash and go to the toilet, but also in additional playing space. In any case, the problem of "I will not go brush my teeth" can be solved by itself. Separate attention deserves plumbing,specially designed for kiddies. Toilets designed for toddlers do not have sharp edges or corners. All seats have a mini backrest and are small in diameter, so children will not be afraid to fall into the toilet. Ergonomic seats also allow you to slowly disaccustom from the pot and get used to the "adult" toilet. Thanks to the innovative Ecototal technology, the washbasins are equipped with a convenient mixer for the sink. It is easy to use, saves water and reduces the risk of burns from a hot tap. Powder colored coating of the mixer handle makes it convenient for children's hands and helps to understand what needs to be turned so that water flows.